After years of failed attempts, California could be just days away from approving statewide regulations on its enormous medical cannabis industry. The legislative session adjourns on Sept. 11, which gives lawmakers and dozens of stakeholders involved in negotiations a chance to strike an agreement at the eleventh hour. The key now is appeasing all of those stakeholders – which include industry leaders, law enforcement representatives and healthcare officials – while also conforming to new proposed bill language released by Gov. Jerry Brown’s office last week, according to insiders. “What’s been happening for at least the last two years is we’ve been trying to smoke out the governor – pun intended – as to what his preferred regulatory approach might be,” said Sean Donahoe, an industry political consultant. That happened last week, according to the East Bay Express and confirmed by others with knowledge of the closed-door negotiations. Although California was the first state to legalize MMJ – way back in 1996 – it never managed to craft statewide regulations on the medical cannabis industry, resulting in a patchwork of local rules that vary greatly depending on the municipality or county. The lack of regulations has led to uncertainty for businesses, general confusion in the market and a continuous fluctuation of companies that start up only to be shut down by anti-cannabis officials all over the state. A statewide regulatory scheme would help stabilize what ranks as the country’s largest MMJ industry, which generates an estimated $1 billion in medical cannabis sales annually. It also likely would help pave the way for recreational marijuana, which is widely expected to be approved by voters next year. It’s unclear what precisely the final bill will include as far as specific regulatory proposals, since the governor’s office declined to comment for this story or share Brown’s draft language. But there are some hints as to what is to come. There would be a dozen state business licenses to choose from for those in the industry, such as cultivator, dispensary, manufacturer, testing lab, and more. Organic certifications would be put in place, and testing would likely be required. Local governments could still ban commercial marijuana activity. Grows would be limited to one acre, or 20,000 square feet, according to the East Bay Express (the paper didn’t specify if the former would apply to outdoor grows and the latter to indoor). Delivery services would be prohibited unless either tied to a physical storefront or expressly permitted by a local jurisdiction. There could be requirements that medical cannabis would have to be sold in the geographic region where it’s grown. 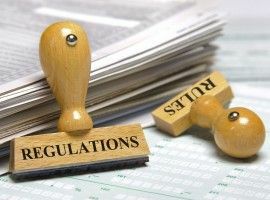 Much of the specific regulations, however, would be left to rulemaking under the authority of one – or possibly several – state agencies, sources said. Brown reportedly preferred to go with a bigger picture regulatory bill and leave a lot of details to administrators. The talks that are ongoing involve dozens of stakeholders. Donahoe named several, including representatives from the League of Cities, the Sheriffs Association, the United Food and Commercial Workers Union, the Teamsters, the California Medical Association, Americans for Safe Access, California NORML and the Emerald Growers Association, among others. What’s unclear is exactly what the next steps may be. According to legislative staffers, three MMJ-related measures – including Assembly Bills 266 and 243, along with Senate Bill 643 – were gutted down to simple language that conveys the California Legislature’s intent to regulate the industry. That was likely a result of Brown’s office weighing in for the first time, with backers of the bills making room for the governor’s preferred changes, insiders said. The governor’s suggested bill language still likely will undergo further revisions. The final language may either be amended into one or more of the three gutted bills, or form the basis of an entirely new bill that may be introduced before the session adjourns, possibly even as late as Sept. 10. “It may be difficult, but where there’s a will there’s a way,” said one staffer. However it happens, many with knowledge of the ongoing negotiations said they think this will become the year that California regulates the MMJ trade. “I’m feeling pretty good about it,” said Khurshid Khoja, an attorney and founder of Greenbridge Corporate Counsel, who works closely with cannabis companies and has been involved in the talks. “All the stakeholders have lined up, including law enforcement and the cities and counties, and they have remained on board, and now that we’ve got the governor’s office and staff involved… it seems to me that we’re headed in the right direction, and it’s very promising that we will wind up with a regulatory structure by the end of this session,” Khoja said. Assembly Member Jim Wood also believes the legislature and the governor’s office are “very close to consensus to regulating medical marijuana,” the Times-Standard reported on Friday. But it’s still not a done deal, said Amy Alley, communications director for Assembly Member Rob Bonta, who sponsored one of the three MMJ bills that was gutted last week. “We’re of course hopeful and optimistic that we’ll find a solution, but we can’t read the tea leaves,” Alley said. I am pretty sure that an acre is closer to 43,500 square feet than it is to 20,000 square feet. I assumed they meant one acre outdoor or 20k ft indoors. I am pretty sure an acre is an outdoor measurement and square feet is an indoor measurement. My guess would be you can have an acre if it’s outdoors or 20,000 square feet if inside. I do hope my math is correct like Damian Solomon or I will be in big trouble. This Gives Hope that people want to grow the economy in the light I do hope they will grant Industrial Hemp for Farmers. Hopefully they get it right? It’s has to be statewide (which it doesn’t seem to be) or we’re back to the same old BS where local law enforcement refuses to follow the law and we’re living in court another 20 years. My attorney says it won’t change 215 but would regulate the for profit industry like retailers, large scale growers, and producers of related products. Of particular concern is the pro-union language inserted courtesy of Dan Rush and others of his UFCW ilk, and the glaring AB 266 exemption for the City of Los Angeles, where UFCW has locked up its dispensary gains after funding the Proposition D campaign. Now the Teamsters want a crack at the transportation licensees. If you want a cannabis regulatory program saddled by special interests from the start, look no farther than what’s taking shape in Sacramento. Why would indoor or outdoor environment matter on a commercial cultivation facility? The plant density should be about the same in both situations. I still dont understand what difference it makes. I can design a 1 acre (45,000 sq ft) modern high tech greenhouse facility and it will produce as much or more per square foot than an indoor facility with 50% less operation costs. I know that some states are allowing larger greenhouse operations, with some as large as 12 acres under glass (540,000 sq ft).